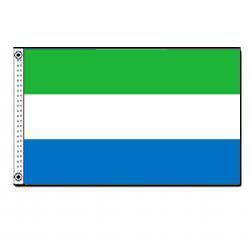 Sierra Leone adopted this flag in 1961. Green stands for agriculture, mountains, and natural resources. Blue represents the hope that the natural harbor in Freetown will contribute to peace in the world. White symbolizes unity and justice.